Back of card: Pale green, based on the Eight of Chalices (shown above). May be inverted. Comments: In the introduction, it says, It might seem odd but if you're looking for a fun, happy, helpful, and at the same time, discreet friend, you can turn to a flower. Flowers, in fact, don't stop at curing our sadness, alleviating our troubles, and giving our skin and home a nice smell, they also make salads more fun, necklines more seductive, they make love notes more tender and perhaps make the future read in the tarot even more appealing, or at least, acceptable. That's how this deck, based on the secret language of flowers, their symbolism, legends, and origins, came about: ancient gods, nymphs or feys transformed into plants as a punishment, or to escape bad luck. Flowers are the most magical of magic plants. The wee folk associated with them, while skinny & child-like in appearance, are actually adults. Despite this deck, they are as often naked as not (images of naked children are, if you're not aware of it, prohibited by law in the US). In this deck, Swords are represented by white flowers, blue flowers for Chalices, red for Wands, and yellow for Pentacles. As befits a deck based on so rarefied a species, there are no unhappy cards in this deck. Even the Ten of Swords, about as grim as card as can be, is here wonderfully pleasant. While the major arcana in most modern tarot decks is based on the Rider-Waite prototype, note the Lovers card, above. It, as well as the Magician, are based on the earlier Marseilles models. 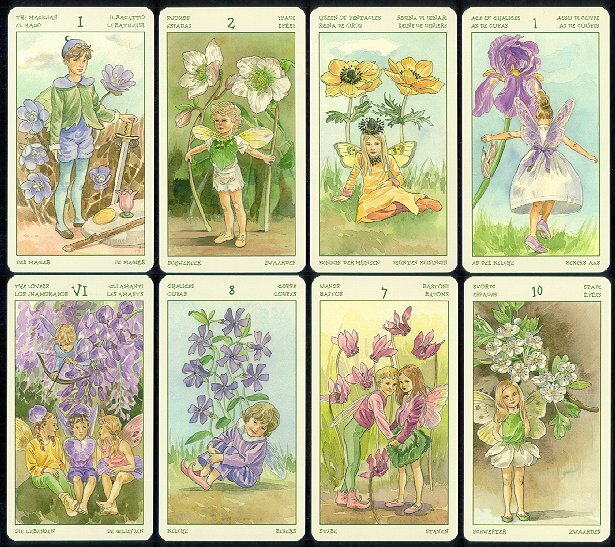 There is a different flower shown on each of the 78 cards, all of which are listed in the booklet with the deck. Those of you who know your flowers will find divination with this deck most fascinating, or so I would imagine.